Rocky Ridge trucks offer a range of lifted Jeep models to choose from, with current offerings including the Adrenaline, K2, Pinnacle, Stealth, and Summit. Each has its own unique style and features, but all provide a reliable lifted Jeep that will take you off-road with style or just help you see around obstacles on the road. Here are some of the top-selling 2018 lifted Jeep models worth your consideration. The Jeep Wrangler K2 is named after a mountain that is among the tallest in the world and nicknamed “Savage Mountain.” Rocky Ridge created this lifted Jeep with the goal of being able to scale that tough mountain – if you dare. The package begins with a 3.5-inch Rocky Ridge Sport Suspension Lift Kit with 2.0 dual tube shocks, a high steer conversion, e-coated high-performance coil springs, Rocky Ridge’s Pure Drive Technology, replacement sway bar end links, and more. From there, it gets 18-inch black-powder-coated wheels and 35-inch mud-terrain tires. Throw in the Rocky Ridge Full Armour bumpers, signature Rocky Ridge taillight guards, 8,500-pound synthetic rope winch, and nylon web roll bar straps, and you are almost done. To make this lifted Jeep model even more popular, it can also include a dozen different premium options such as custom leather seating, hurricane fender flares, the 435-horsepower Petty Performance Pack, a backup camera, and a heat reduction hood. The Mad Rock is perfect for those who want to ford streams and climb mountains with this vehicle’s off-road features that can take you nearly anywhere. Like the K2, it begins with a 3.5-inch Rocky Ridge suspension lift kit, but this is the Sport X version with 3.0 monotube shocks. The Jeep Wrangler Mad Rock sits on 20-inch wheels and Mickey Thompson MTZ 37-inch tires. The exterior features powder-coated steel fenders with flares, a heat reduction hid, a front skid plate, LED front turn signals, a Fab Fours Grumper front bumper Grumper, retractable side steps, and an off-the-door tire carrier brake. Similar premium features are available, along with a snorkel system and full exterior stealth armor coating. As the name implies, Rocky Ridge built the Jeep Wrangler Summit to be able to climb up to the summit of any mountain you choose to tackle. It has a comfortable ride plus handling while on the road plus the confidence to tackle tough terrain. 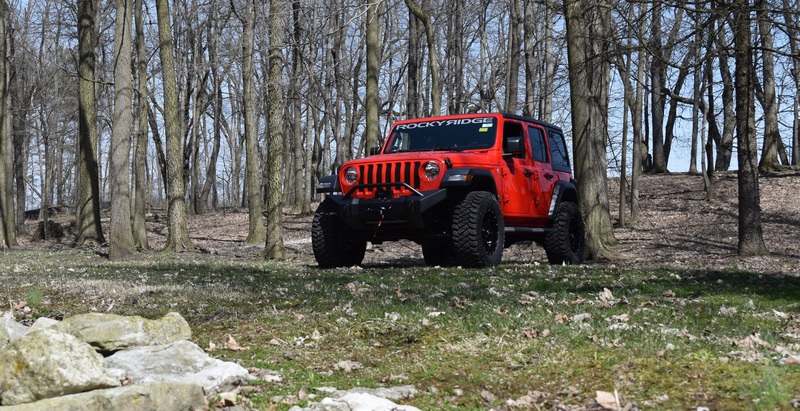 Enjoy the 3.5-inch Rocky Ridge Sport Suspension Lift Kit, 35-inch all-terrain tires, Rocky Ridge Elite Series bumpers, LED lighting, and Rocky Ridge rear light armor.